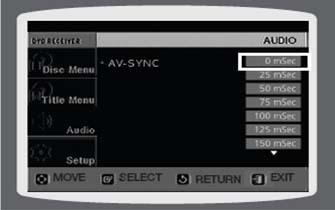 How do I set up AV SYNC in Audio setting ? Video may look slower than the audio if it is connected to a digital TV. If this occurs, adjust the audio delay time to match the video. 2. Press the Cursor ▼ button to move to Audio and then press the ENTER button. 3. Press the Cursor ▼ button to move to AV-SYNC and then press the ENTER button. 4. 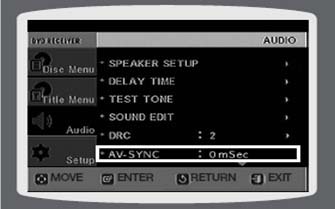 Press the Cursor ▲,▼button to select the AV-SYNC Delay Time and then press the ENTER button. • Press the RETURN button to return to the previous level. • Press the EXIT button to exit the setup screen. Why Do I Get Black Bars On My TV While Watching DVDs? How to listen to radio on my standard home cinema system?